Avete domande sulla spazzatura o le tasse? Precisa de informações sobre os centros comunitários? The City of Vaughan recently launched Language Line, a translation service designed to help a diverse population get answers from city hall in a tongue they’re comfortable with. Residents calling Access Vaughan at 905-832-2281 now have the option of communicating instantly in 170 languages, including Italian, Russian and Chinese. 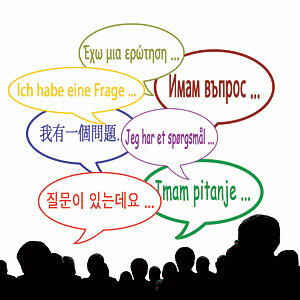 Even the more infrequently spoken Hmong, Hausa, Oromo and Telugu tongues are available. When a call comes in to Access Vaughan requiring translation, staff will initiate a three-way call with the translation service provider. A dual-handset telephone will facilitate translations at city hall’s information desk. According to Statistics Canada’s 2006 census, more than half of Vaughan’s population speaks a mother tongue other than English or French.